Let’s imagine you have written the perfect headline – it’s catchy, powerful and enticing. But when you go to Google and search the keyword you’re targeting, your article just won’t show up – what might have gone wrong? Unfortunately, we can’t give you real-time feedback and in-depth analysis on an individual article right here on our blog (start a News Dashboard demo today for that), but we can show you how news publishers compose their headlines around their topics to show up on the Google search engine result page (SERP). But first, let’s talk about keywords. When we talk about keywords, there are two important aspects. Keywords are numbers, words or a combination of them that best describe your article’s content. Of course, one article can be connected with a number of different keywords. Let’s say your headline is: “Brexit: Jeremy Corbyn on Theresa May’s EU negotiations”. Related keywords could be for example: Brexit; Jeremy Corbyn; Theresa May; EU: European Union; European Union negotiations. The keywords should be related to your article, but they don’t have to be included in your headline. Don’t confuse keywords with categorization. You should choose keywords that you monitor or optimize your headlines and articles for based on two factors: What keywords do you want authority for in Google, and what are users searching for? There are several resources that you can use, including but not limited to: Google Trends, Google Analytics, search queries “by hand,” your own expertise, analytics and visibility tools like the News Dashboard,etc. Most importantly, you should know yourself, the search engine and your potential readers really well. 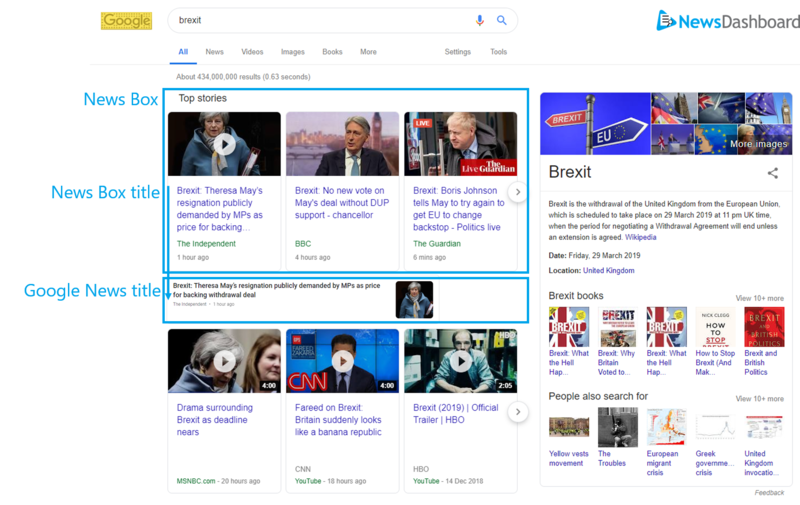 When you spot the keyword with the best fit for your topic, make sure to add it to your article and possibly your headline, so Google can make the connection accordingly. The Google News front page, with the respective article headlines/titles. An example of an article headline/title in a News Box in compared to the same article on Google News. What if your problem isn’t ranking – or appearing in the News Box or Google News – for the keyword you’re targeting, but that your headline is shortened or your article shows up with a totally different headline? Google is a bit of a wild-card here, so you have to change it up according to them. It helps to track your article regularly in different areas on Google, because your article could appear with different headlines for different keywords; and on the Google News page differently than in the News Box or as an or organic ranking on the SERP. Google may also shorten your headline – ending it on an ellipses, choosing parts of your URL for the headlines, or pulling sub-heads and article text as a headline. Google’s crawler might be having difficulty finding or seeing your news sitemap. Writing headlines that are too long, i.e. longer than the maximum character limit on desktop and mobile. Your target keyword is not often in your article headlines/titles. Bonus tip: Capitalize on your success and put the keywords you are currently ranking well for via search in the headlines/titles of related articles to rank better even better for them. Keywords in headlines/titles: Where do I put them? 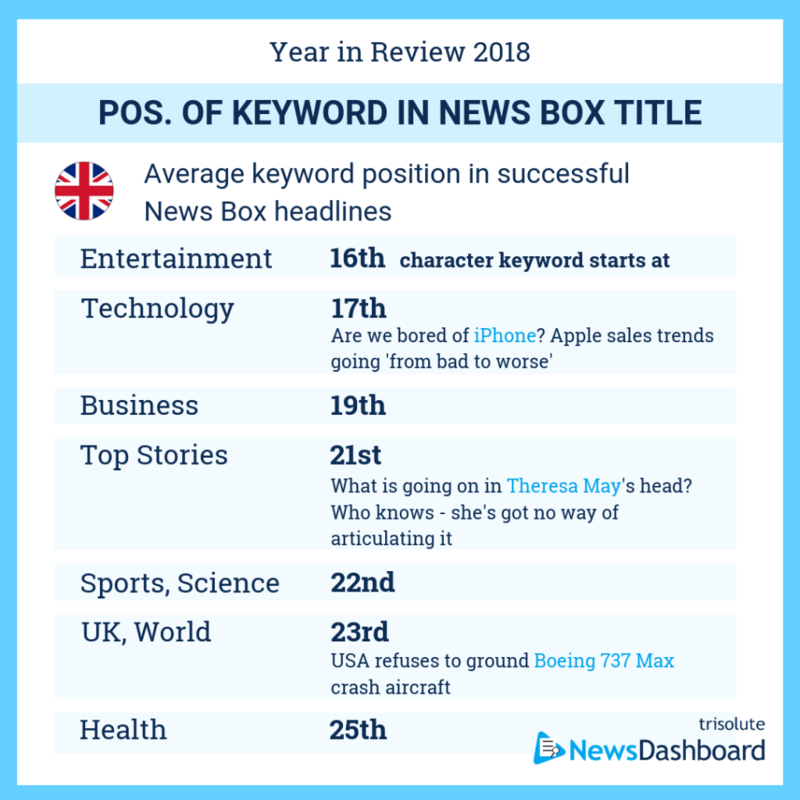 While there are different strategies for adding keywords to your headline/title, we can say a bit about how other publishers do it and, more specifically, where they put their target keywords. There are a lot of great tools for A/B testing your headline and many articles written about how to compose the most click-worthy headline with power words, numbers, questions and so on. But we want to give you data about the most visible rankings from the News Boxes in 2018, and hopefully you can take advantage of what the most successful publishers in six countries have been doing all along. Because there wasn’t much of a difference for desktop and mobile, we combined them. 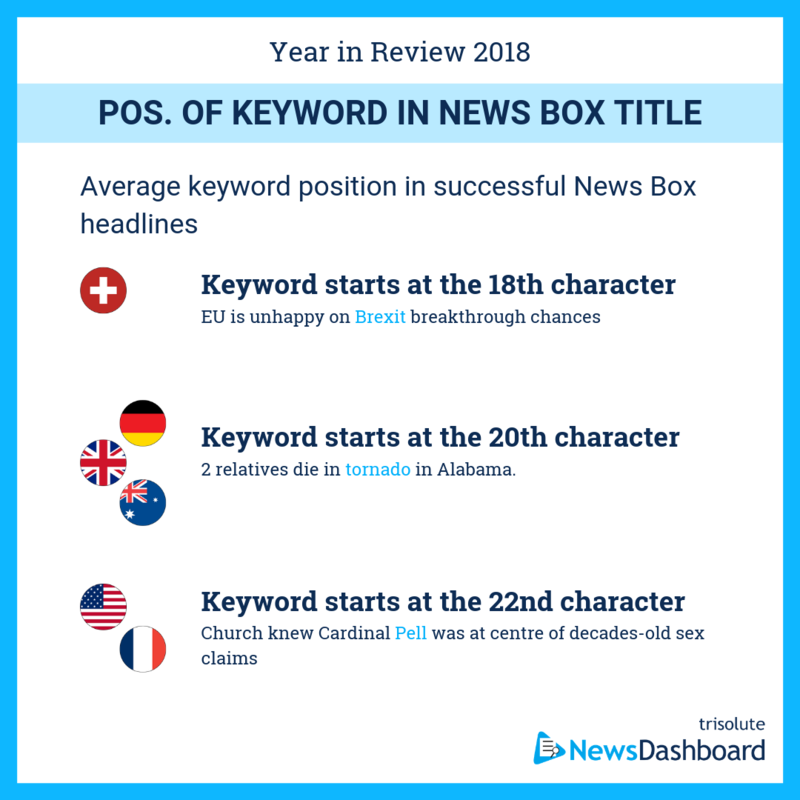 In general for Switzerland, the keyword starts the earliest in the title; while Germany, Australia and the UK are in the middle; and the U.S. and France have the overall latest mention of the keyword. 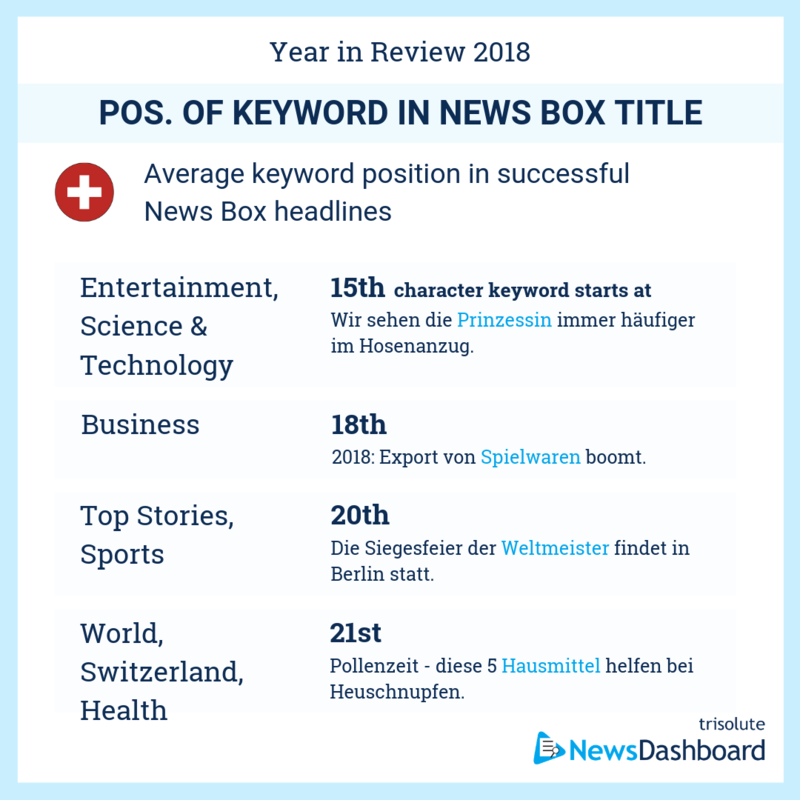 In terms of when a keyword appears first in any country for an individual category entertainment and science news in Switzerland are the earliest. The last a keyword starts is in the US and Australia for health news. 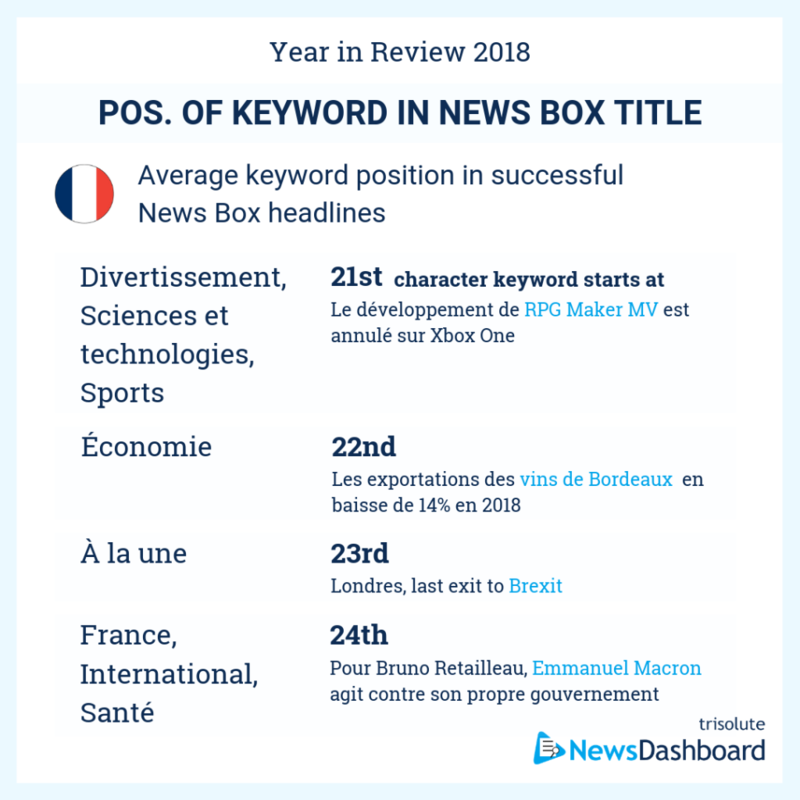 In France all keywords in headlines started after at least 20 characters. 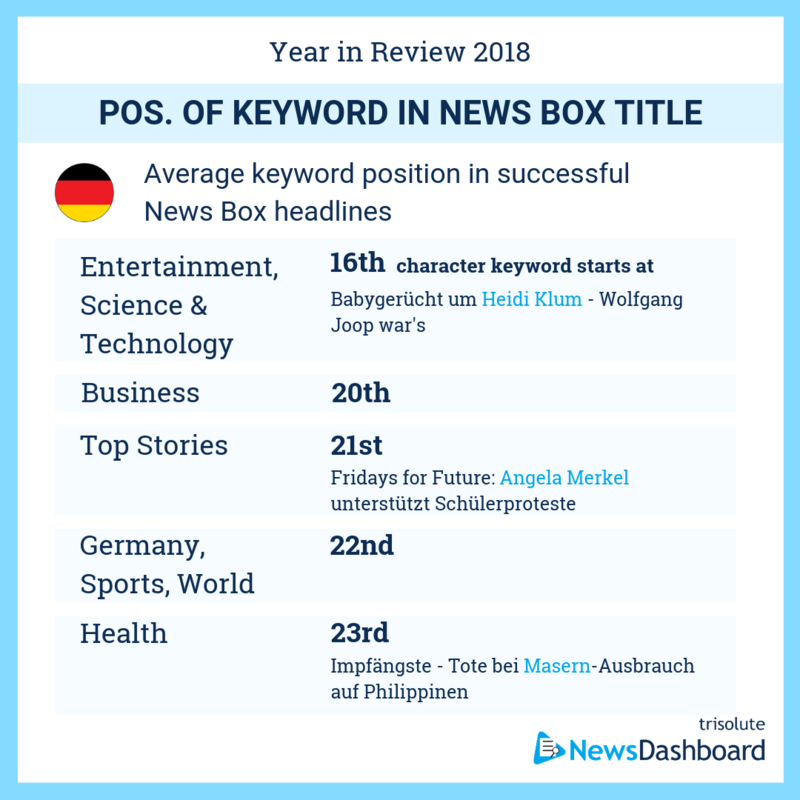 Generally, keywords appear in all countries nearer the front of a headline/title for entertainment and technology or science and technology news – they start here between the 15th and 21st character. 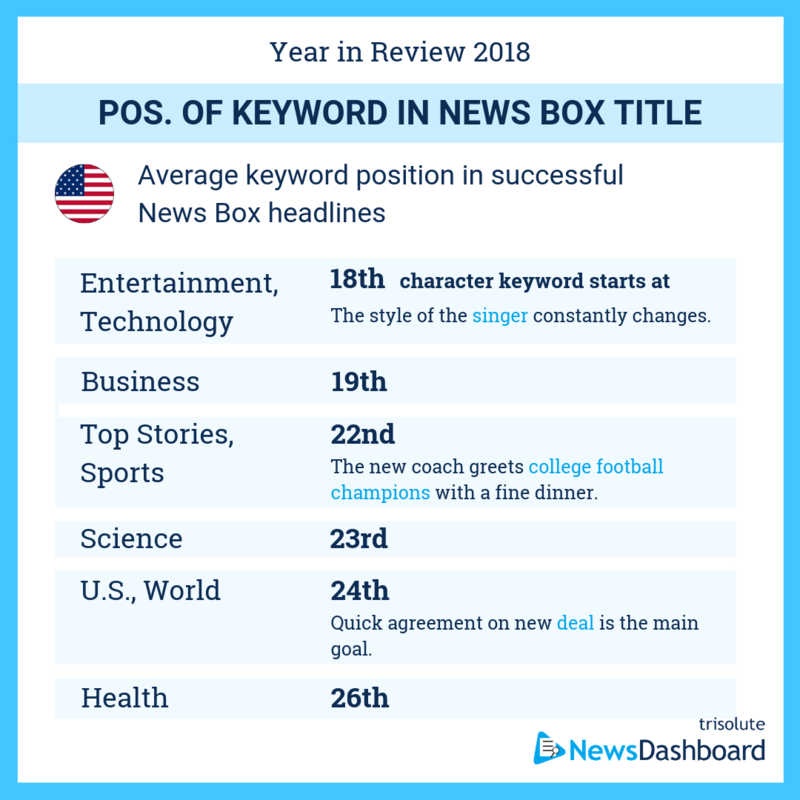 For health news, the keywords appeared last, between position 21 and 26. You can check all the individual starting points in the picture above. Now, start working on your headlines and don’t be afraid to put keywords in locations other than the front. 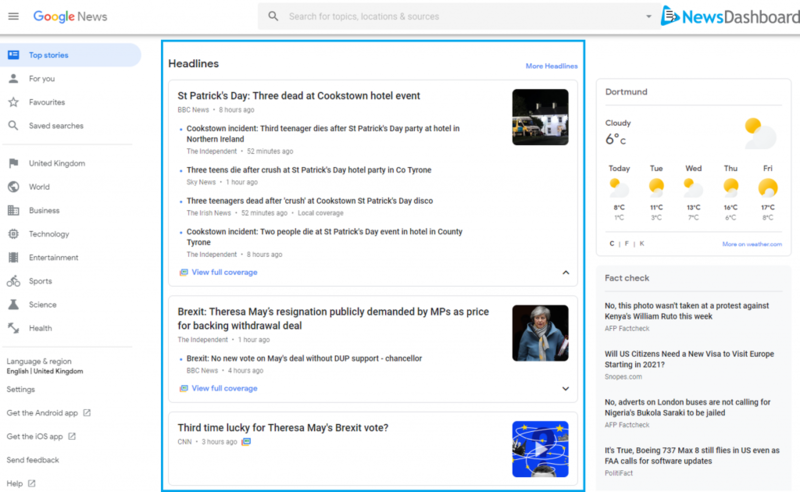 If you want to consistently check your headlines and the visibility of your articles in the SERPs and in Google News, feel free to check out the News Dashboard. 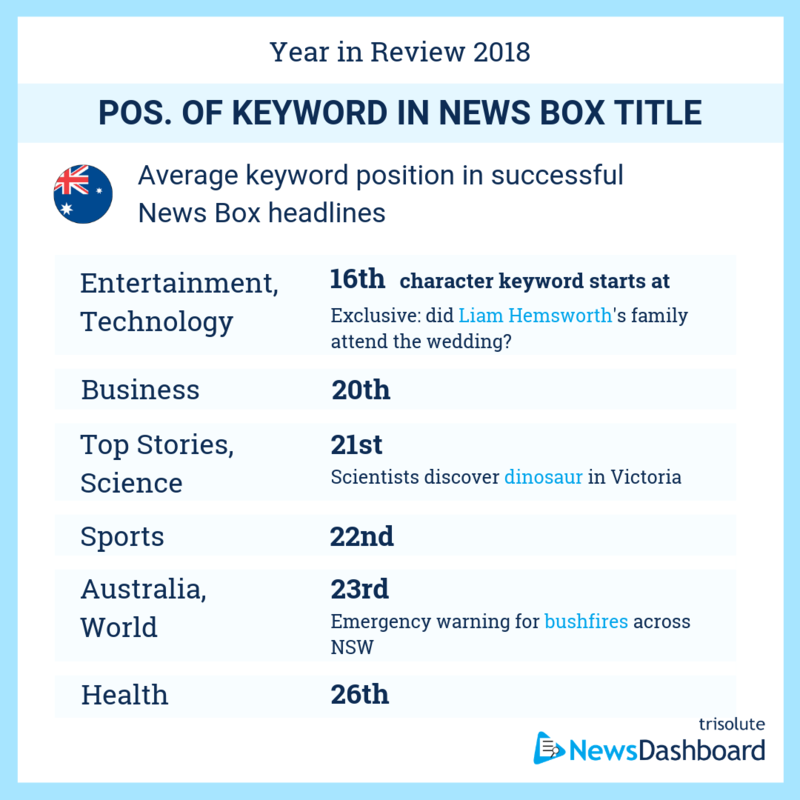 Acknowledgements: The basis of this analysis is the general keyword set and the visible rankings in the respective mobile and desktop News Boxes. We collect our news-related keywords from Google News (news.google.com) as well as Google Trends, and keywords are from Jan. 1-Dec. 31, 2018. Rankings on the SERPs are checked every 15 minutes.